PHILADELPHIA (AP) — Once Aaron Nola got an early lead, he was home free. 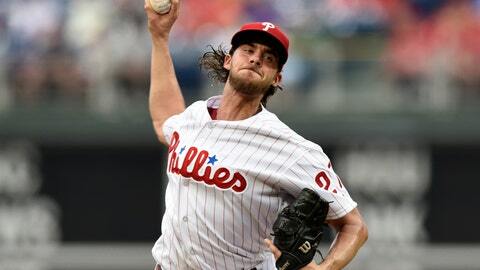 Nola struck out 11 in seven impressive innings to stay unbeaten at Citizens Bank Park, pitching the Philadelphia Phillies past the New York Mets 4-2 on Friday night. “There’s been a lot of Cy Young Award chatter leading up to today. Obviously, you can see why,” Phillies manager Gabe Kapler said. “He rises to the occasion. he’s ready for the biggest moment. And it’s just like no spot is too big. No spotlight is too bright. He just elevates his game, and we saw that tonight,” he said. Syndergaard (8-3) allowed four runs on eight hits with five strikeouts and two walks in 5 2/3 innings. The tall right-hander has battled injuries again in 2018, missing two months with a finger injury and then 10 days last month due to hand, foot and mouth disease. “Today was more of a step in the wrong direction,” he said. Nick Williams and Jorge Alfaro also drove in runs for the playoff-contending Phillies. Cabrera’s double put the Phillies ahead and Williams followed with an RBI single. Cabrera, traded from the Mets to Philadelphia last month, scored on Carlos Santana’s double-play groundout. That was more than enough for Nola, who struck out the side in the first and retired nine of the first 10 Mets. The only batter that reached during that stretch, Jose Bautista, got on because of an error by second baseman Cesar Hernandez. “Just trying to make quality pitches,” Nola said. New York got its lone run off Nola in the fourth. Jeff McNeil led off with a single, the first hit off Nola, went to third on Jackson’s single and scored on Todd Frazier’s sacrifice fly. The Phillies stole a season-high five bases, including the first two of the season by the catcher Alfaro, against Syndergaard. Mets manager Mickey Callaway said it’s an area Syndergaard will continue to work to improve. “Bottom line is he needs to get better and I think he will,” Callaway said. Hernandez’s misplay made it 94 errors for Philadelphia, which began play second in the majors to St. Louis (95). Mets: An MRI on the left index finger of RF Brandon Nimmo revealed no structural damage. Nimmo, who was injured on Thursday, was not in the lineup Friday but could play on Saturday. … Reliever Bobby Wahl was placed on the DL with a right hamstring strain and LHP Daniel Zamora was recalled from Double-A Binghamton. Zamora made his major league debut, pitching 1 1/3 scoreless innings with two strikeouts. Mets ace Jacob deGrom (7-7, major league-best 1.81 ERA) opposes RHP Jake Arrieta (9-7, 3.33) in the fourth game of the five-game set on Saturday afternoon. DeGrom is 6-1 with a 2.45 ERA in 13 career starts against the Phillies and struck out seven in eight shutout innings of a 3-0 win on July 11. Arrieta is 2-2 with a 1.99 ERA in eight career starts vs. the Mets.